I dream of cake all the time, forever looking for an excuse to bake. This is not so good for my waistline, nor for my standing as a good parent. Lemon Meringue Cake had been on my mind for a while and this condition only worsened after I finally made it. Nigella says her lemon meringue cake happened by accident, but I’d never call it a mistake. It’s light and delicate, lemony and crisp with a delightfully fresh flavor. The meringue isn’t quite that spongy foam, but just the dainty crispness everyone adores. Meringue is so beautiful, delicate, light, crispy and sometimes a nightmare to make. All looks well when you peek through the oven glass and see it rising and browning beautifully. Then, you take it out of the oven and within minutes, it deflates, cracks and crumbles. Anyone who’s ever put a good effort into baking meringue knows it’s one of those where failure is almost guaranteed. There are a few simple tricks to getting it right. Don’t make that face – you can do this. There are various types of meringue. Technically marshmallows count, but since I’ve never made them, we’ll omit them until I’ve got some experience. Let’s talk about what I do know. Egg Whites: Fresh and cold. Reach for the back of the supermarket shelf for the freshest eggs and make sure they’re free-range. Happy hens make the best eggs. Sugar: With meringue, it’s important to know your sugars. Ordinary table sugar is ok, but stock up on the superfine variety. It’s insurance against cracking and makes you sound so fly. Also known as caster sugar, superfine sugar may not be easy to find. Make your own. Take ordinary white granulated sugar and grind it in a food processor to a fine consistency. It may be tempting to toss powdered (aka confectioner’s or icing) sugar into the mix, but I don’t recommend it. Powdered sugar contains corn starch which may affect the consistency of your meringue. Acid: The last thing you want near your delicate peaks of egg whites is acid, right? Wrong. Acid actually adds to the structural stability of the meringue by denaturing protein in the egg whites. Cream of tartar (tartaric acid), vinegar or lemon juice are all great choices. For chocolate meringue, balsamic vinegar is superb. Equipment: In the good old days, Grandma whipped egg whites by hand. She must’ve had a mean right hook, because that’s a lot of work! Nowadays, a stand mixer does the job in a couple of minutes without cramping your biceps. Just make sure that both the bowl and whisk are super-clean. Even a smidge of protein leftover from your last baking project could prevent the whites from fluffing up nicely. Lemon meringue cake is a show-stopper. With a bit of planning, anyone can make it. First order of business is the lemon curd, which can be purchased from Trader Joe’s imported from England. After a recent trip to the store sent me home empty-handed, I resorted to something crazy and made it at home myself, from scratch. It was divine. Smooth, creamy, just sweet enough with a sunny yellow color and bright lemon flavor. I won’t need those jars from the store anymore. The lemon curd can be made ahead of time and stored in the fridge up to 2 days. It’s delicious on its own, with some berries, even frozen as ice cream, but delightful in this cake. Next, make the meringue. This can done the day before you intend to serve the cake. Butter two 8-inch round baking pans. Line the bottom with parchment paper. Blitz yolks, 1/2 cup white sugar, butter, flour, cornstarch, baking powder, bicarb and zest in a food processor. Incorporate lemon juice and milk. In a very clean mixing bowl with a very clean whisk, whip egg whites and cream of tartar until peaks form. Slowly add 1 cup superfine sugar. Spread meringue over yolk batter. Smooth the top of one and pull meringue into peaks on the other. Transfer the cake pans into the hot oven. Remove from oven and wait 10 mins before taking cakes out of pans. Rest on metal racks to finish cooling. Meanwhile, whip the heavy cream with a dash of vanilla until thick and set aside. Set one cake meringue-side-down onto a pretty cake plate. Spread whipped cream over the golden yolk cake. Cover with the lemon curd. Carefully place the other cake, this time meringue-side-up, over the lot. Use a serrated knife to cut clean slices and serve with fresh berries. This cake is gorgeous served with fresh berries and a good cup of tea or coffee any time of year, for any excuse. It freezes beautifully and the meringue keeps crisp in the chill. It’s lovely with just one layer of freshly whipped cream and homemade lemon curd. But, the first time I made it, I went over the top, literally, with yet another layer of luscious cream & curd! The crisp meringue eventually melted and disappeared into the soft topping, making for an entirely different experience. Try it both ways. See which you like better. That way, you get to bake this lemon meringue cake twice. Oh my, this is one of the most beautiful things I’ve seen! Definitely want to try for my birthday next week! Wow, Colette! This looks so amazing. I never knew that the sugar makes a difference when making meringue! I always wondered why mine cracked. Now, I will give your advice a try next time I make my Pavlova! Thanks for such great recipes. This is one hell of a cake. I loved the ingredients and it seems so mouth-watering! What kind of milk do you use for this cake? Girl, you have to TASTE it! I just used plain old 2% milk, but you can use anything you like. This recipe looks so good! I love how the cake turns out — rustic and elegant all at once. 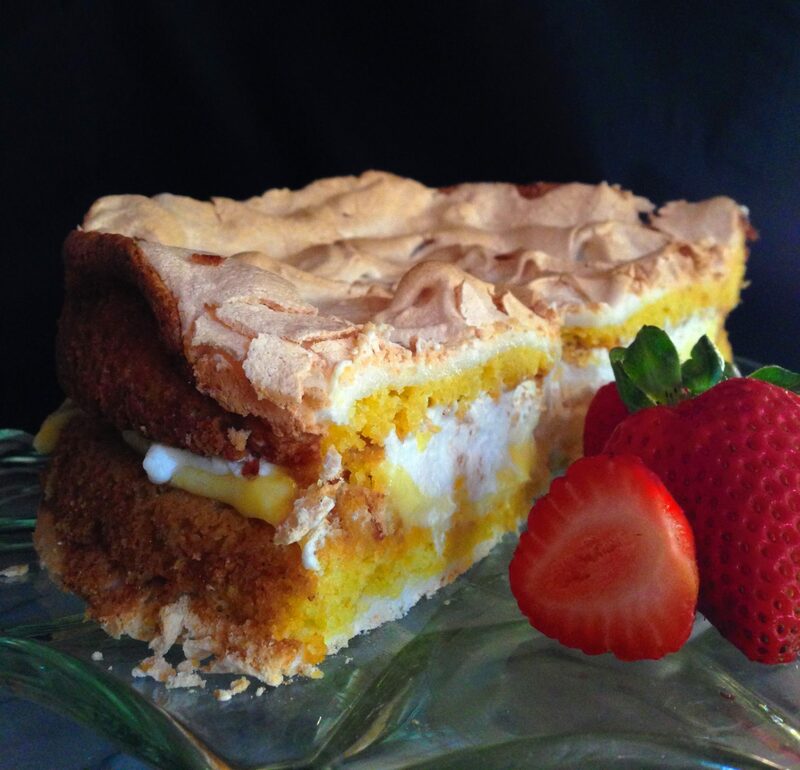 And that crispy layer of meringue on top — oh my! Yes, please!